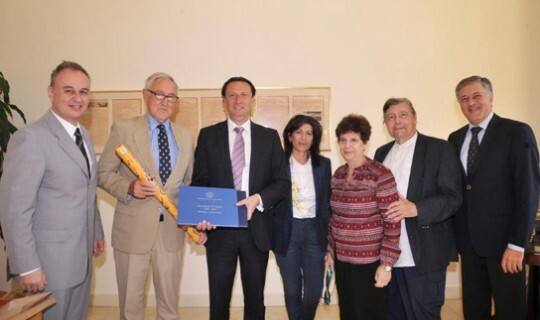 The President of the Greek Community of Melbourne, Mr. Vasilis Papastergiadis and Ms. Georgia Charpantidou, responsible for the Historical Archives of the Greek Community of Melbourne, visited the Psychico College on Tuesday, October 10, 2017. Mr. Papastergiadis and Ms. Charpantidou met with College President, Mr. Richard Jackson, as well as Mr. Dimitris Karamanos - Head of the Scholarship Program, Mr. Apostolos Athanasopoulos – Coordinator the School Units and Director of Psychico College High School, Ms. Alexandra Papazoglou – Director of the HAEF Libraries, and Mr. Dimitris Tsigkros – Head of e-Learning and the Informatics Centre. This meeting was held to review the operation of the “Melbourne - Athens: A Journey of Friendship” Program and to investigate the possibility of expanding collaboration. Following the meeting, Mr. Papastergiadis and Mr. Charpantidou were given a tour of the College premises by Mr. A. Athanasopoulos. Afterwards, Mr. Papastergiadis visited Choremi Auditorium where he met and spoke with Psychico College High School students involved in the Program and well as the Club’s Teacher-Advisor, Ms. Ioanna Tsiligianni. The Program was designed and implemented as a result of the initiative of Sociologist and Psychico College teacher, Mrs. Maria-Filio Tridimas, during academic year 2016-2017 and will continue to operate this new academic year utilizing the latest communication technologies. Obliterating the distance between Melbourne – Athens, it has provided a mentorship role to Psychico College 10th grade students who help teach the Greek language to 9th grade students in the Greek Community schools of Melbourne – to students who are second or third generation Greeks. At the same time, it has provided College students with the opportunity to become acquainted with the culture of Australia, in particular their way of life and living conditions, as well as the achievements of Greeks in Melbourne, through communication with their counterparts there. Mr. Papastergiadis was favorably impressed by the facilities and high standards of our School and stressed the importance of the Program for our respective student communities as well as for our School’s overall relationship with Hellenism in Australia. "We spent 3 wonderful hours at the school. We were introduced to the Head of school, the School President and numerous board members. The hospitality was outstanding,” Mr Papastergiadis said. “What impressed me even more were the school facilities. We are used to schools in Melbourne having state of the at facilities but it seemed to me that this school rivalled if not exceeded those of our best private schools. “The school has an outward looking focus. It is open to the world and in exploring opportunities globally for its students. Its subject offerings are first class. “Equally, the school assists many students with tuition fees in the difficult economic times that Greece is encountering. It takes a very responsible approach. “In terms of school grounds, I have never seen such a beautiful campus. It is aesthetically pleasing, well set out and with amazing views. The students are hosted in the best possible environment. “I also had the opportunity to address the students who had taken the option of working on the mentor program between the GCM schools and the College. I explained the importance of students engaging with peers around the world and making friends. Empathy and understanding comes through interaction and this program between the 2 schools allows are students to build these characteristics.